Provided photo Pictured are Todd and Jean Bettman of Shops by Todd, Inc. of Dayton and Congressman Warren Davidson. 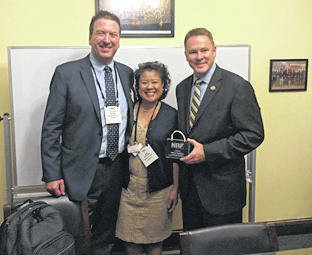 WASHINGTON, D.C. — On Thursday, Congressman Warren Davidson (R-Troy), representing Ohio’s 8th District, was recognized by the National Retail Federation for consistently supporting public policy priorities important to the retail industry and its millions of small business members. The awards were presented as small retailers across the country gathered in Washington for NRF’s Retail Advocates Summit. https://www.tdn-net.com/wp-content/uploads/sites/21/2018/09/web1_Davidson.jpgProvided photo Pictured are Todd and Jean Bettman of Shops by Todd, Inc. of Dayton and Congressman Warren Davidson.